The family of a 77-year-old Islandmagee great-grandmother who is trapped in Nepal following a massive earthquake are appealing to the Foreign and Commonwealth Office to make her evacuation a priority. Marita Prendy is currently working in a the Druk Amitabha Mountain DGK nunnery outside Kathmandhu, and has been sleeping in a rain-soaked tent on the mountainside since the serious earthquake struck on Saturday April 25. 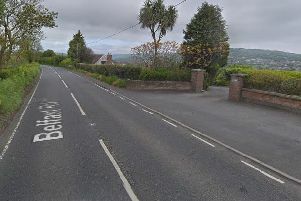 Her daughter Jane, also from Islandmagee, told The Times that the family had to wait two days before receiving word that her mother was safe and well. She revealed: “When the earthquake struck my mother was visiting Kathmandu zoo with a couple of the nuns. “It is an open space whereas at the nunnery the staircases were breaking and there was a lot of damage. “She returned to the nunnery but the British Embassy still hasn’t contacted her or found her although they say she is high priority. “They are still feeling the aftershocks out there and everyone is worried that there is going to be another enormous earthquake. Mrs Prendy has been spent six months a year in Nepal for the past decade, helping the nuns by teaching them English, gardening and painting murals. The nunnery is the site of a popular Buddhist temple, therefore the English lessons are invaluable in helping the nuns communicate with visitors. Pensioner Marita fell in love with the country after travelling there with Jane, who is married to Nepalese native Rishi. Jane continued: “We are very relieved that all Rishi’s family are ok and that our house out there hasn’t collapsed but everyone in Nepal is very shaken and scared. So far, the earthquake has caused one confirmed British death, while around 120 British nationals were flown home from Nepal on April 29. However, Jane says that despite numerous calls to the Foreign and Commonwealth Office, her mother has not yet been contacted by British Embassy officials. She continued: “My mum doesn’t want people to worry, if the embassy come for her she will go with them but she says she is safe so far. “However, we are worried as she is sleeping on the ground in a rainy environment without electricity, running water and with telephone lines down in an area where there is a risk of landslides. “Originally my mum had booked a return flight on May 8 and we are just hoping she can get to it as we don’t know if she will be able to get down the mountain or what the state of the roads is between there and the airport. “We are calling on the British embassy to get her home sooner on an earlier flight. “Two airlines are flying there at the minute and other British citizens have been evacuated but we are still waiting for the FCO to make contact. Despite the hardships suffered by the Nepalese people, Jane is full of praise for the nuns and the work they do. She revealed: “The nuns call my mother “Abi” which means grandmother in Tibetan, and one of me told them over the phone not to worry about her as she is very strong. “The nuns help the local community by holding eye clinics, dental clinics and medical care. They also perform services like keeping the streets clean by picking up rubbish. When contacted by The Times regarding Mrs Prendy’s case, a Foreign and Commonwealth Office spokesperson stated: “We cannot comment on individual cases. “Communications and logistics across the country are a challenge but the team in the embassy are working around the clock to help. “We understand how difficult it is for relatives in the UK. “We have given practical assistance to more than 300 people in Nepal. The Times has passed information on Mrs Prendy’s location and condition to The Foreign and Commonwealth Office in London. Meanwhile, Jane and her husband, who run the company Namaste Nepal, intend to donate the profits from their stall at the Leukaemia and Lymphoma Fair in Whitehead on Saturday May 2 to the nunnery. The fair takes place in the Brown Memorial Hall, King’s Road, Whitehead, from 10.30am-5pm.